The roasted garlicky-goodness, perfectly distributed in each bite of this beautiful loaf of bread, is perfection. And baking it in the wrap-around heat of a cast iron pan? Well, that makes it just that much more amazing. Yes, I am a fan! Traditionally, this bread was baked in a clay pot or pan. For today’s home cook, a cast iron skillet is a perfectly fine substitute. 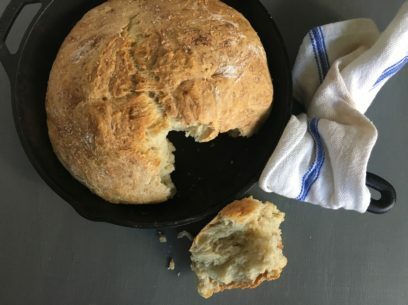 The even baking heat from the cast iron (or enamelware) pan gives the whole loaf a lightness that usually only comes with kneading so do try to bake your bread in a good, heavy pan or skillet. A 10″ cast iron or enamelware pan is ideal for this loaf size. Crunchy sea salt flakes (sometimes called finishing salt) are absolutely glorious on top so make sure you sprinkle them generously over your loaf right before it goes into the oven! If they aren’t available, Kosher salt with it’s big, rough pieces is just wonderful too. The dough is super-simple and I would only emphasize that you pour the water in one cup at a time. After adding the first cup, very thoroughly mix in the dry ingredients before adding the second cup of water. This helps to remove any of the tiny dry flour pockets or bubbles that sometimes form in no-knead yeast recipes. This can affect the texture of your bread’s finished crumb so do take the extra few seconds and mix well! The dough takes anywhere from 8-12 hours to rise, basically a ‘set-it-and-forget-it’ overnight or daylong rise. The trick to evenly distributing the mashed roasted garlic is to mix it into the dough by hand. I’ve tried it with spoons and spatulas but none are ever as good as getting right in there with your hands. To be honest, it’s actually kind of fun. Another good tip – unless you have a very sharp knife or utility blade, try using a kitchen scissors with open blades dipped in flour to cut the cross in the top of your loaf. The risen dough is a kind of loose, a little bit wet type of dough and sometimes not the easiest to slice with a less than super sharp blade. The kitchen scissors work every time and, blades dipped in flour, there’s just a quick rinse to clean. Think a working person doesn’t have time to bake their own bread? This is actually a fantastic recipe for working home-bakers. Just take (literally) a couple of minutes in the morning to mix the dough together, cover and set dough to rise. When you get home at the end of the day, it takes only a few minutes more to pop the risen dough into your skillet and into the oven. 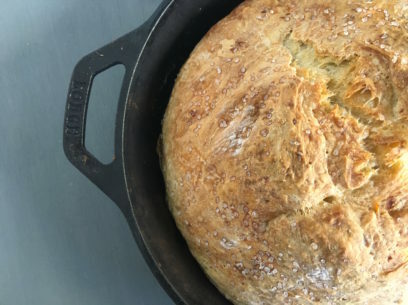 In less than an hour, you’ll have a gorgeous, golden, warm loaf of homemade bread on your table Couldn’t be easier to work into a working-day or any-day schedule! Add water 1 cup at a time, combining all dry ingredients with first cup of water before adding second cup. Important so take your time to incorporate first cup completely before moving to second. Right before uncovering the risen dough, flour a clean cutting board or counter surface lightly and prepare kitchen scissors with blades dipped in flour. Then preheat oven to 400 degrees and put cast iron or enamelware skillet in over to preheat at the same time. I like to keep the pan in the oven for about 15 minutes so usually a few minutes after the oven has preheated. Turn out risen dough onto floured surface, a rubber spatula can help here, and gently – you don’t want to accidentally punch down the rise! – shape into a ball. Transfer dough ball from the floured surface to hot pan, a dough scraper is helpful for this. Remove from pan immidiately and allow to cool for at least 10 minutes on a wire rack before cutting. This is important because, with cast iron, the bread will continue to cook if left in the pan. Serve and enjoy this beautiful bread all on it’s on or with – EVERYTHING! 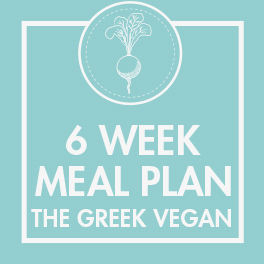 Thank you for this appealing recipe! I have printed it out and hope to bake it as soon as I refresh my garlic supply. I love baking in cast iron, and having the smell of baking bread filling the house. I also appreciate your cleanprint option! Beautiful bread, I added Kalamata olives and garlic what a combo. Hi there. This recipe looks incredible, I’ll definitely have to give it a try! A quick question – 400 degrees Fahrenheit, not Celsius, right? I’m from Australia, so will just have to adjust oven temps to suit the recipe! 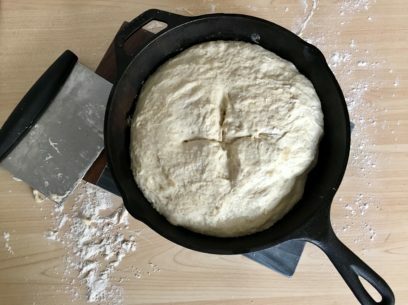 Is there any reason why the (risen) dough couldn’t be carefully transferred directly to the hot skillet? Oooh roasted garlic bread is a wonderful idea. Universe expanded! When I was a little girl in Greece it was my job to collect the bread from the bakery in the mornings. It was so hot and fresh that the baker would tie a string around the bread and tie the other end around my hand. I’ll be trying this recipe. I cooked it this morning and took to some friends today in the afternoon and everybody liked it. I think I’ll made it again and again. Thank you so much for this receipe. A lot of tips are essential for the good result of this receipe. I’ll try some new ones in a very close time. I don’t have a cast iron skillet…will a Le Creuset work? If you haven’t got a skillet……a cake tin? Thank you for the recipe! Awesome bread, made this today to go with my homemade canned garlic pasta sauce. My hubby and I both loved it! Definitely will keep a loaf on hand. active dry yeast here, Vandy, and not sure about fresh yeast as I’ve never used it – though I do definitely want to!